• 1 bath, 3 bdrm townhouse - MLS® $97,000 - Reduced/Motivated Seller! "Private End of Group Townhome"
Riverchase, Halethorpe - Very private 3BR/3.5BA end of group townhouse by the woods. Interior is freshly painted with new blinds, spacious kitchen, updated stainless steel apppliances, overhead microwave, ceramic tiile with walkout to large deck. Walkout finished basement with full bath. Hardwood floors in foyer and 1/2 bath, ceramic tile upper baths, master bedroom cathedral ceiling & closet organizer. Home secuity system. Close to BWI, MARC Penn Line and I95, 695, and 895. 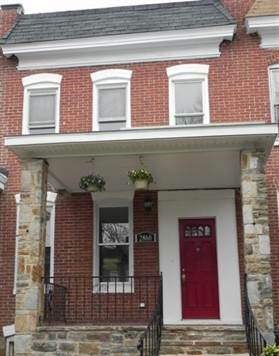 Cylburn, Baltimore - Announcing a price reduction on 2860 W Garrison Avenue, a single story. Now MLS® $103,000 - . 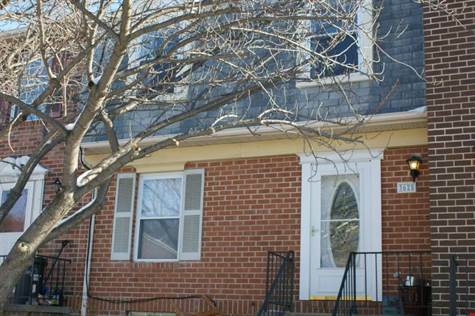 Abingdon, Harford County - 3 BEDROOMS, 1.5 BATH TOWNHOME W/PRIVACY FENCED BACK YARD. FAMILY ROOM HAS WALK OUT BASEMENT, WOODBURNING FIREPLACE & HALF BATH. SEPARATE ROOM IN BASEMENT FOR OFFICE OR PLAYROOM. WALK-IN CLOSET IN MASTER BEDROOM. FRENCH DOORS LEAD TO DECK OFF DINING ROOM. ROOF REPLACED IN 2006. Medford, Baltimore - Just Completed! Beautiful luxury home on 1.36 ac. lot. 4BR, 4.5BA brick w/stone accents accents by Ltd. Homes. Open floor plan w/2 story foyer & Fam. Rm w/FP and cstm moldings, lg gourmet kit. w/ granite and gorgeous hrdwd floors, adj. bkfst area and conservatory w/wet bar. Formal LR and DR, private study w/side enterance to wrap around porch. Expansive MBR with sitting area and private balcony w/stone FP. MBA complete w/jacuzzi bath w/marble surround and sep. shower. 2nd fl Lndry. 3 car gargage. Buyer pays all transfer taxes and stamps. Medford, Baltimore - Announcing a price reduction on 13105 Pendleton Ct., a 8,310 sq. ft., 4 bath, 4 bdrm 3 story. Now MLS® $1,699,000 - Just Completed. Q: Is a short sale as damaging to a borrower's credit as a foreclosure? A: Generally speaking, yes. In both cases, a borrower's credit score can fall 100 points or more. A borrower with an initial credit score of 780 could fall to around 620 as a result of a foreclosure or short sale, according to Fair Isaac Corp. A borrower with a 680 credit score could see a drop to 575. Still, lenders are trying to give borrowers an incentive to complete a short sale and avoid foreclosure. Mortgage giants Fannie Mae and Freddie Mac allow borrowers who complete a short sale to become eligible for a new loan after two years. Borrowers who complete a foreclosure must wait as long as seven years. Q: Why would a lender decide to allow a short sale? A: Lenders generally lose less money on a short sale than on a foreclosure. Foreclosures are more costly because banks must take back the homes and pay someone to maintain them and to resell them. On average, a short sale reduces the lender's loss by at least 20% and can happen in half the time as the average foreclosure, according to a study by research firm TowerGroup Inc. Short sales may also fetch a better price than a foreclosure because occupied properties are generally better maintained. In Orlando, Fla., the average price per square foot on a short sale last month was $147, compared to $122 for a bank-owned property and $188 for a traditional sale, according to Collateral Analytics, a real-estate research firm. Q: How prevalent are second mortgages? A: There are around $1 trillion outstanding in home-equity borrowings, equal to nearly 10% of all the first mortgages, according to Federal Reserve data. Freddie Mac says that 14% of the mortgages that it guarantees have seconds behind them, but that number only includes seconds that were taken out when the first mortgage was originated. Among mortgages that were bundled into securities that don't carry government backing—mainly subprime and other risky mortgages—slightly more than half have at least one junior-lien behind them, according to a study by analysts at Amherst Securities Group LP. Q: What were seconds used for? A: The analysis by Amherst Securities found that when the housing boom first began, the majority of second liens were taken out after the first mortgage origination. Borrowers tapped into rising home equity as an alternative to credit cards to pay for home improvements or consumer debts—medical, tuition or small business bills. But by 2006, the majority of second liens had become so-called piggy-back mortgages taken along with the first mortgage to fund down payments and avoid paying mortgage insurance. Q: Can anything be done to force first- and second-lien holders to cooperate? A: In April, the government launched a voluntary program that provides incentive payments to servicers, investors and borrowers that agree on terms. Under the Home Affordable Foreclosure Alternatives program, holders of second-lien mortgages must accept 6% of the unpaid loan balance to a maximum of $6,000, and they must relinquish all claims. The program has resulted in just 342 sales through September. Sergio Trujillo thought he could avoid foreclosure when an investor made an all-cash offer last month to buy his one-bedroom condominium in La Jolla, Calif., for less than the amount he owes on his mortgage. But a standoff between Mr. Trujillo's lenders over a few thousand dollars threatens to derail the deal, known as a short sale. Like many heavily indebted borrowers, Mr. Trujillo has two mortgages: a first mortgage in the amount of $260,000, which is held by Freddie Mac; and a $50,000 second mortgage, handled by Specialized Loan Servicing LLC. Freddie Mac will allow no more than $3,000 in sale proceeds to go toward the second mortgage. But SLS says it will scotch any deal if it doesn't get at least $7,000. "This is an all-parties-lose scenario," said Brian Flock, Mr. Trujillo's real-estate agent. "There is no housing recovery when this happens." Over the past year, real-estate agents, lenders and federal policy makers have pointed to short sales as one way to revive moribund housing markets while helping troubled borrowers avoid foreclosure. But for homeowners that took out second mortgages during the boom, getting a short sale approved is proving to be a nightmare. Most first mortgages, like Mr. Trujillo's, are guaranteed by government-controlled mortgage giants Fannie Mae and Freddie Mac or held by other investors in mortgage securities. Second mortgages and other junior liens are typically owned by banks and credit unions. Banks are reluctant to write down second mortgages because many are still current, even if the borrowers owe more than the value of their homes. They may also be able to pursue borrowers' assets after foreclosure. "If I'm the second-lien holder, I may say, 'You know what, I want to see if I can hold out for a better deal,' " said Greg Hebner, president of MOS Group Inc., an Irvine, Calif., company that contacts troubled borrowers on behalf of lenders and servicers. The result is a "chicken game" between investors that leads to unnecessary foreclosures, said Jon Goodman, a real-estate lawyer and investor in Boulder, Colo.
As of June 30, 11 million homeowners owe more than their homes are worth and an additional 2.5 million have just 5% equity, according to real-estate research firm CoreLogic. To sell, those homeowners must cover the shortfall or, more commonly, ask the bank to take a loss via a short sale. The short-sale process remains full of land mines. Loan servicers were never designed to handle large volumes of customized workouts and it can take months to bring loan servicers, investors and mortgage insurers to agree on a price. Softening home prices create greater potential for disputes over values. And lenders are wary of fraud. Second mortgages, however, have become one of the biggest roadblocks. More than a third of about 1.33 million properties in some stage of the foreclosure process have at least one junior lien, according to publicly available data tracked by CoreLogic. Many seconds and home-equity lines are worth little in a foreclosure because home prices have fallen so sharply. That gives the second-lien holder "nothing-left-to-lose leverage," said Mr. Goodman. Banks say they are approving deals where they can, but borrowers must agree to some form of debt repayment. About three-quarters of the $1 trillion in seconds outstanding as of June 30 were held by commercial banks, and of those, more than $430 billion belong to the nation's four largest banks—Bank of America Corp., Wells Fargo & Co., J.P. Morgan Chase & Co, and Citigroup Inc. Forcing write-downs on large numbers of those loans could significantly erode their capital. Real-estate agents say some banks are getting better at cutting deals. Wells Fargo & Co. now dispatches employees in some markets to appraise homes even before a short-sale offer has been received to help speed potential sales. Bank of America doubled its staff dedicated to handling short sales to around 2,700 over the past year and began using an online platform to allow for paperless applications and approvals. The bank says it has approved 70,000 short sales through September, double the year-earlier total. In Mr. Trujillo's case, SLS requested far more than the lien was worth on the secondary market, said Mark Johnson, who oversees short sales for Freddie Mac. "That's always been our challenge—participation from second-lien holders," he said. "It's ultimately their decision about whether they want to help us save borrowers in foreclosure." Freddie says it hopes to negotiate a deal for Mr. Trujillo. SLS declined to comment. Jeff Gray waited months to complete the purchase of a home in Litchfield Park, Ariz., as part of a short sale, only to see it fall apart days before closing. Chase, which serviced the first mortgage for Freddie Mac, approved the sale but wouldn't forgive the second mortgage, which it owned. Chase says it has completed 83,000 short sales since 2009. Mr. Gray eventually bought another home in the same neighborhood; meanwhile, the short sale was listed for sale by Freddie Mac earlier this month for $30,000 less than what Mr. Gray had offered. "It's sad," he said. "The grapefruit tree in front is dead, the grass has turned brown, and the shutters are starting to fall." Lynch Manor, Bel Air - Announcing a price reduction on 2723 Cullum Road, a 1,120 sq. ft., 2 bath, 3 bdrm ranch. Now MLS® $239,999 - Just Reduced!. Anyone shopping for a new mortgage these days should shop around, says Cameron Findlay, chief economist for LendingTree. Although mortgage rates look astoundingly low, the spread between what the bank receives and what it pays investors has actually increased, giving banks more room to negotiate. Applicants with good credit scores should aggressively seek the best rates they can find by comparison shopping, starting with the bank they usually do business with. Applications to purchase homes rose 3.4 percent last week compared to the previous week on a seasonally adjusted basis, according to the Mortgage Bankers Association weekly survey. On an unadjusted basis, the purchase index rose 15.3 percent compared with the previous week, but was down 35.7 percent compared to the same week a year ago. This is only the second time in 10 weeks that purchase mortgage applications have increased. “The strength in purchase applications comes from government loans, likely indicating that prospective buyers are drawn by the lower down payment requirements,” says Michael Fratantoni, MBA’s vice president of research and economics. • 30-year fixed-rate mortgages decreased to 4.59 percent from 4.69 percent. • 15-year fixed-rate mortgages decreased to 4.05 percent from 4.12 percent. • 1-year ARMs decreased to 7.17 percent from 7.20 percent.